I don't know how I let this slip by me, or the fact I didn't see it anywhere in my newsfeed. This has got to be by far the strangest/creepiest/whatever else you want to add commercial I have EVER seen. I'd say the creepiest part is when you find the smiling woman sleeping next to Chuck Testa. 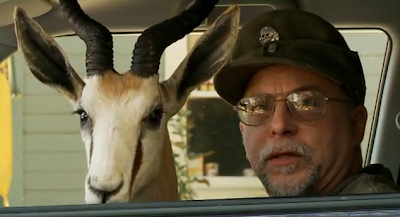 If you haven't watched the commercial already, you will soon find out it's a commercial for Ojai Valley taxidermy. Besides it being incredibly amusing, I'm sure he actually got some new business out of it. If you happen to take him up on his business, just remember that he doesn't do pets. Oh and also, if you decide to look at the Ojai Valley Taxidermy YouTube page, remember that it has some pretty graphic footage, and definitely not for those with a weak stomach.